First-year Doctor of Physical Therapy student Mike Nash has a better idea of the role a physical therapist plays in treating a patient with sepsis, thanks to a recent Grand Rounds lecture. 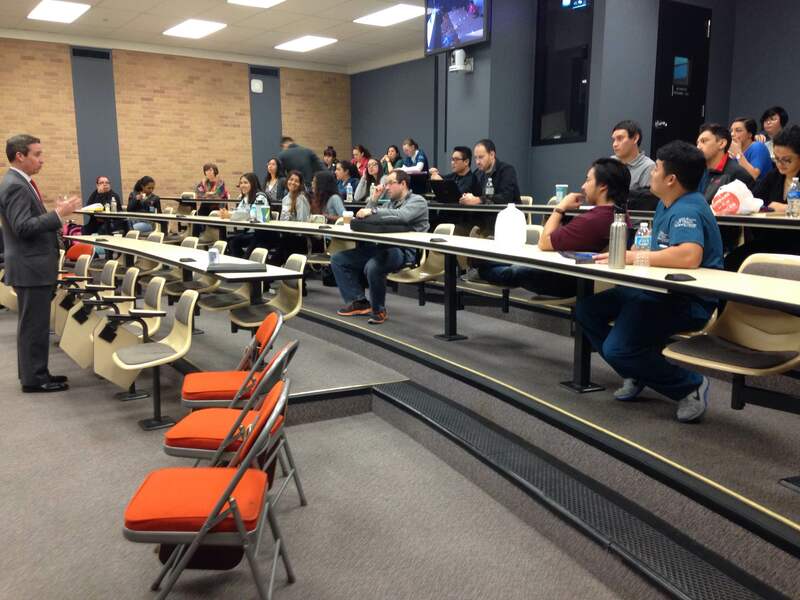 Nash attended both of the Grand Round Lectures series events this fall. Open to all students, the series features faculty from the School of Health Professions and is designed to foster interprofessional exchange by illustrating the ways all six of the School’s health professions treat a range of diseases and disorders. The series debuted in the fall of 2015. This fall’s pair of lectures dealt with infectious disease and pre-term birth, said Dr. David Henzi, Associate Dean for Academic and Student Affairs for the School of Health Professions. Nash said he appreciates gaining insight into how health professionals work together to help patients. “In terms of interprofessional education, I think that’s the best that we can offer, where you get to go and see where you fit into a team,” Nash said. The series includes lunch and is hosted both on the Long and Greehey campuses. For more information and to RSVP, please email GonzalezDavi@uthscsa.edu.